Andhra's favorite green is Thotakura (Amaranth/Chauli/Mulakeerai) after of course Gongura (Hibiscus cannabinus/red sorrel leaves/Roselle). Every morning in the streets of our Vizag you will hear vegetable vendor shouting and selling these farm cut fresh greens. Koi thotakura is the one with red stems and locally grown in Andhra. Here in US we don't see this vareity often, its almost like nil here in NJ. My SIL sent me these garden fresh Koi-Thotakura from her backyard through my In-laws visiting us from Boise, ID . Here is a picture of leafy vegetable patch in her backyard. 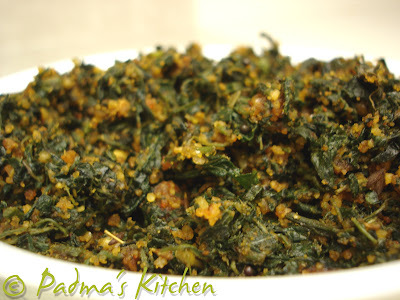 Thotakura can be cooked with dals/lentils, can be stir fried or just sauted with light seasoning. 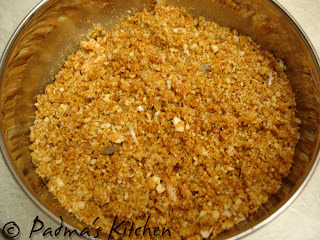 Today I am blogging my MIL's recipe which is very tasty and can be a side dish with plain rice, and roti. 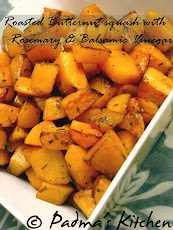 I am sending it to Vani from Batasari, the host of Weekend Herb Blogging started by Kalyn from Kalyn's Kitchen. 1. Wash and dry the leaves on a kitchen towel, make sure its dried thoroughly. Then coarsely chop the leaves along with the stems discarding any tough ones. 2. Heat oil in a large pan, add mustard seeds and let it splutter for a minute, then add the rest of the seasoning ingredients and let it fry for a minute. 3. 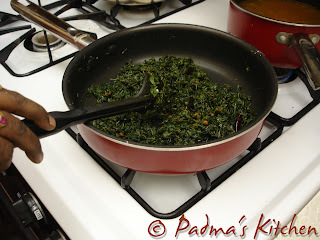 Add the chopped leaves and stir occasionally for even cooking, sprinkle the salty water over the leaves, saute and cover with a lid for 4-5 mins. 4. The leaves will shrink down and now is the time to add the grounded powder of garlic, peanuts and chilli powder. Mix well and cover for another 2 mins till it dries out of any excess water. 5. Serve with Rice and dal or Rotis/Indian flat bread. 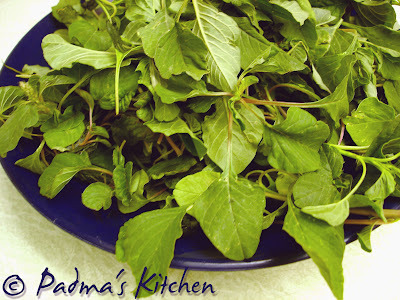 Padma,I grew some of those Amaranth last summer in small flower pots, loved it. Patch looks so good there.I will plant them on the ground this Summer. Oh BTE, your sil's patch looks lovely! I like your ground mix. It will go really well with a number of dry veg dishes. What a lovely patch, n the harvest is great. Its always so nice to have homegrown stuff. Delicious subzi..
ooh wow! I really am looking for some new greens these days! can i get these in an Indian store, you think?? your SIL grows this in this season? wow. i need to buy some amaranh seeds now. your pics are lovely. seeing this post brought back my mom's cooking in my taste buds..it really made me miss home! Oh ho, these were the leaves you were referring to when I mentioned about the sorrel fruit and drink - good to know. I miss thotakura sooo much here. I buy erra thotakura from Korean store :(, it works from me. Something is better than nothing right!! 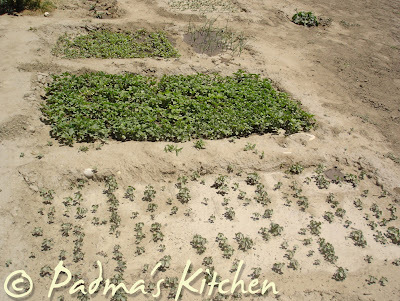 oh padma ....this looks yummy and delicious ! lovely koora! I grew up in Andra and love all andra delicacies! :) mouthwatering! I posted the award you gave sometime back! Thanks a ton for the same. I am rightnow busy till 2nd week of feb. Will try to blog hop as and when I find time. Amaranth truly rocks, doesn't it? I love the depth of flavours that it has. My sister makes this and i love them. But we don't get them here. I just stumbled on your blog.You have a very nice collection of recipes.I Bookmarked you and I'll be coming back for more.This is a very nice recipe. I like the spice mix your MIL has added padma. The mix of garlic-cumin-chile-peanuts sounds just fantastic. I've never tasted this type of greens, but I can tell it would taste wonderful prepared this way. the greens look like bayam (spinah in Indonesia). we usually make it for curry or stir-fry. lovely! didn't taste as i expected!!! !